This stylish and contemporary villa has 316sqm of generous living space spread over two floors. 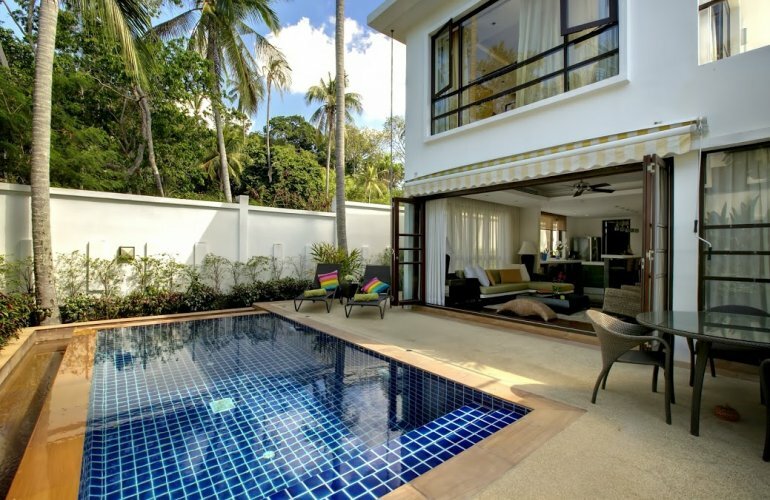 One of just five stunning villas surrounded by tropical landscaped gardens and feature ponds beside the golden sandy beach at Bang Por on the island's north coast. The villa offers three spacious bedrooms with en-suite bathrooms including an extra large master bedroom featuring an open bathroom concept. The entrance leads through a private courtyard into an open plan living and dining room with a fully equipped Western kitchen. Folding doors open up the living room to a spacious terrace and a salt purified private pool. A spiral staircase connects the pool area to a roof terrace offering fantastic panoramic views of Koh Phangan and the Gulf of Siam beyond. The contemporary tropical architecture of this villa maximizes the use of light and ocean breeze. It is fully equipped with flat screen TVs, satellite channels, DVD, complimentary wireless broadband, electronic safe, I-pod docking stations, local mobile phone, the finest linen, towelling and a full range of quality accessories. A blend of natural materials and soft colours for furnishings and decor, as well as high end technology guarantee an ultimate experience of luxury and comfort. In addition to the villa's own private pool a 30 meter beachfront pool with ample deck space is accessible to all guests. This magnificent setting boasts spectacular views of Koh Phangan and the waters beyond. The villa is conveniently situated a short distance from the island's main ring road ensuring easy access to the restaurants, shops and entertainment, making an ideal location for a relaxing and peaceful vacation.